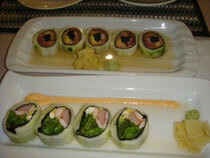 One of new menu at ‘ Katana’ Japanese restaurant ‘ Fantasy Roll( Kani-Su) Rolled salmon, tuna, avocado(pear) etc. by cucumber. Yummy!! It’s perfect dish for new year.